Earthquakes can originate from sudden motion along a fault, from a volcanic eruption, bomb blasts, landslides, or anything else that suddenly releases energy on or in the Earth. Not every fault is associated with active earthquakes. Most faults are in fact no longer active but were active at some time in the geologic past. of the active faults, only some are particularly prone to earthquakes. Some faults are slippery, and the two blocks on either side just slide by each other passively without producing major earthquakes. In other cases, however, the blocks stick together and deform until they reach a certain point at which they suddenly snap, releasing energy in an earthquake event. Rocks and materials are said to behave in a brittle way when they respond to built-up tectonic pressures by cracking, breaking, or fracturing. Earthquakes represent a sudden brittle response to built-up stress and are almost universally activated in the upper few kilometers of the earth. Deeper than this, the pressure and temperature are so high that the rocks simply deform like silly putty and do not snap, but are said to behave in a ductile manner. 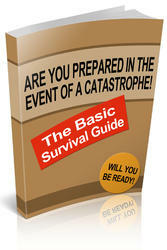 An earthquake originates in one place then spreads out in all directions along the fault plane. The focus is the point in the Earth where the earthquake energy is first released and is the area on one side of a fault that actually moves relative to the rocks on the other side of the fault plane. After the first slip event the area surrounding the focus experiences many smaller earthquakes as the surrounding rocks also slip past one another to even out the deformation caused by the initial earthquake shock. The epicenter is the point on the Earth's surface that lies vertically above the focus. Note: Casualties from the 2008 Wenchuan earthquake and the 2010 Haiti earthquake were still being tabulated at the time of writing. ripples that move across water after a stone is thrown in a still pond. After the seismic waves have passed through the ground, the ground returns to its original shape, although buildings and other human constructions are commonly destroyed. In really large earthquakes the ground is deformed into waves of rock, several feet high (~1 m), moving at very high speeds. During an earthquake, several types of seismic waves can either radiate underground from the focus—called body waves—or aboveground from the epicenter—called surface waves. The body waves travel through the whole body of the Earth and move faster than surface waves, whereas surface waves cause most of the destruction associated with earthquakes because they briefly change the shape of the surface of the earth when they pass. There are two types of body waves—P (primary or compressional) waves, and S, or secondary waves. P-waves deform material through a change in volume and density, and these can pass through solids, liquids, and gases. The kind of movement associated with the passage of a P-wave is a back-and-forth-type motion. Compressional (P) waves move with high velocity, about 3.5-4 miles per second (6 km/second), and are thus the first to be recorded by seismographs. This is why they are called Primary (P) waves. P-waves cause a lot of damage because they temporarily change the area and volume of ground on which humans have built or modified in ways that require the ground to keep its original shape, area, and volume. When the ground suddenly changes its volume by expanding and contracting, many of these constructions break. For instance, if a gas pipeline is buried in the ground, it may rupture and explode when a P-wave passes because of its inability to change its shape along with the earth. 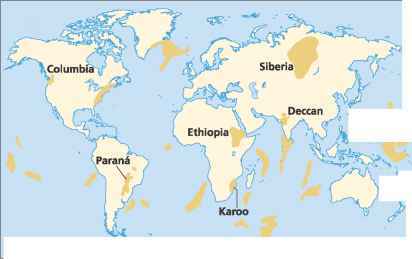 Fires and explosions originating from broken pipelines commonly accompany earthquakes. History has shown that fires often do as much damage after the earthquake as the ground shaking did during the quake. This fact is dramatically illustrated by the 1906 earthquake in San Francisco, where much of the city burned for days after the shaking and was largely destroyed. Similarly, much of the damage and loss of life from the 1995 magnitude 7.3 Kobe, Japan, earthquake was from fires ignited by gas lines and home heating systems. 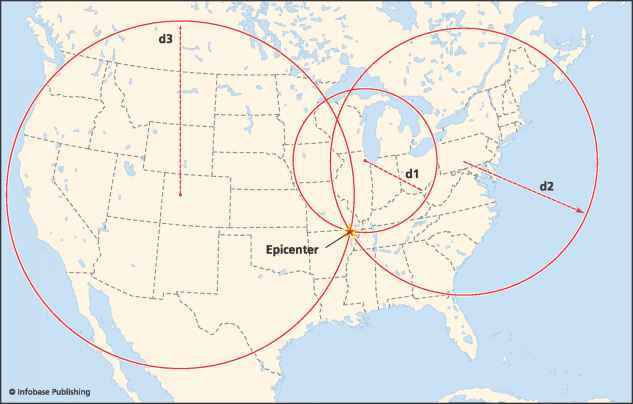 Method of locating epicenters by calculating the distance to the source from three different seismic stations. The distance to the epicenter is calculated using the time difference between the first arrivals of P- and S-waves. The unique place that the three distance circles intersect is the location of the epicenter. Analogy to seismic P- and S-waves using slinky and rope and thus they consist of an alternating series of sideways motions. Holding a jump rope at one end on the ground and moving it rapidly back and forth can simulate this kind of motion. Waves form at the end being held, and they move the rope sideways as they approach toward the loose end of the rope. A typical shear wave velocity is two miles per second (3.5 km/ second). These kinds of waves may be responsible for knocking buildings off foundations when they pass, since their rapid sideways or back-and-forth motion is often not met by buildings. The effect is much like pulling a tablecloth out from under a set table—if done rapidly, the building (as is the case for the table setting) may be left relatively intact, but detached from its foundation. surface waves can also be extremely destructive during an earthquake. These have complicated types of twisting and circular motions, much like the circular motions one might feel while swimming in waves out past the surf zone at the beach. surface waves travel more slowly than either type of body wave, but because of their complicated motion they often cause the most damage. This is a good thing to remember during an earthquake, because if one realizes that the body waves have just passed one's location, there may be a brief period of no shaking to go outside before the very destructive surface waves hit and cause even more destruction. What is rigin of earthquake? What is the origin of earthquake? What is the origin of earth quake?